Fascinating stuff. These tid bits are amazing and I see the logic to them if you go back in time. The first one is so arrogant of Stevie to make such a statement. But go back in time. The Superbowl appearance was only weeks after the inauguration in January 1993. I actually just remembered wondering if Stevie and Lindsey were going to make an appearance since they were just back together again. Its also right before rehab and Stevie is very frustrated during this time. So in the context of this being right after the reunion and before her world came crashing down...it makes sense. She does not want to miss the spotlight. Billy and Al Gore seemed odd to me but not when you think about it. Al Gore was the US Senator from Tennessee. The Gore family is famous there going back to Al Gore's dad. So it makes sense these 2 would cross paths. However, I think its a safe assumption that the band was going to be asked to play at the inauguration anyway. Don't Stop was the campaign theme and I think it would have happened anyway even without Billy talking to Al Gore. Its probably factual what Billy said but he may be taking a bit too much credit for the Mac's performance. In 2000 Hillary Clinton contacted the band to perform at the White House. I see someone in the campaign or inauguration executive contacting the band's representative to make it happen. In fact I think there is a Mac special where Mick talks about being reached out to about performing. Love these details and gotta get this book! Last edited by Macfan4life : 08-03-2017 at 01:45 PM. That's weird. Didn't Stevie always say she had to beg and beg Lindsey to do it and say she'd never speak to him again if he cheated her out of the opportunity? So if it was never a requirement that he perform to begin with and Billy could've done it, why would she have done that? She hated Lindsey excessively during that time it makes more sense for her to have been pleased that Billy perform instead of him. Its important to remember that Lindsey was the original vocalist (first verse) and player on the song. With such an international audience it made sense to ask Lindsey to come back and play. Everyone remembered Fleetwood Mac the way they were. Not many knew anything about Rick and Billy except the die hard fans. Still a slap in the face to someone who was still an active member of the band, especially in light of the Al Gore connection. There was no reason that Billy couldn't have joined them with Lindsey as vocalist and Billy backing him on guitar. I just ordered the book. Should have in a day or two with Amazon Prime. Can't wait to read it. 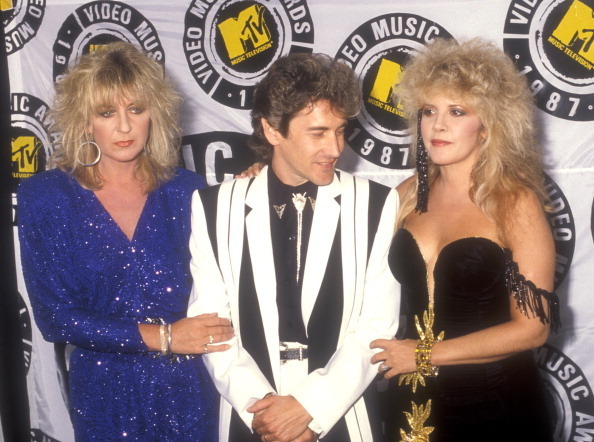 so not a fan of Stevie's stage costumes during this era. All the bad stuff of the 80s and none of the good stuff of her 70s outfits. Oh, man- I think Stevie looks stunning in that picture! Sure it's an 80's look- it was the 80s! I wish there were more pictures of Stevie released, along with Christine, Rick, Billy, and Lindsey. That photo of the band on the back of the FM Greatest Hits album is so classy, not to mention the few photos from Tango and Mirage. I'm around a quarter of the way through the book, and I gotta say....I ain't impressed! The writing is sloppy and the editing is non-existent. Bad punctuation, typos and repeating lines is bad enough, but misspelling names, some times numerous times, is inexcusable, especially with pretty famous individuals. Proof positive (for me) that, once again, great song writing ability doesn't always transfer over to being a great author! The book seems rushed to me. He gives little, quick stories and then moves along to the next little story. I wish he would have spent more time on his memories. He's met and worked with so many people. Thanks for posting BWBoy.. I'll check it out. You sold me on it. Logging a storied nine-year run slinging the six-string forFleetwood Mac, penning pivotal anthems for everyone from Ray Charles to Gregg Allman to George Strait, and calling the "Fathers of Rockabilly"--The Rock 'N Roll Trio's Dorsey and Johnny Burnette--"dad" and "uncle," respectively, BILLY BURNETTE has spent a lifetime living and breathing rock 'n' roll. All of this comes together on his upcoming solo album CRAZY LIKE ME--due out October 20--and just-released memoir. 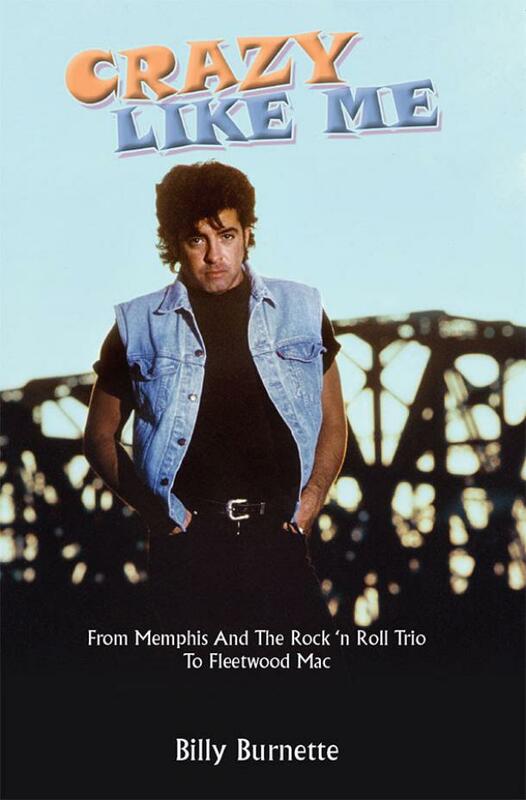 For the very first time, the award-winning singer, songwriter, guitarist, and musical journey man shares each step of his fascinating five-decade career via the memoir, Crazy Like Me: From Memphis and the Rock 'N Roll Trio To Fleetwood Mac. The album and book's release will be celebrated with a show in Nashville on September 3 at 3rd and Lindsey (8pm show time). Powered by his rapid fire and captivating prose, the book chronicles unbelievable stories from growing up a Burnette in the wake of The Rock 'N Roll Trio's rise to notoriety as an influence on the likes of Led Zeppelin, Elvis Presley, and more, cutting his first song with none other than Ricky Nelson at seven-years-old, recording and touring the world with Fleetwood Mac, and all of the wonderful madness in between. 2017 proved the right moment for this tale to be told. "I'm not getting any younger," laughs BILLY. "There are all of these stories about The Rock 'N Roll Trio that people just don't know. I wanted the world to hear them. Through the process, I found out even more than I ever knew-and I was there! I had to write the book to get the facts right before time goes on, so nobody forgets what they did. At the same time, it was a chance to tell my own story. While working on it, it felt right to release the album alongside of the book." Recorded between his home studio and the House of Blues Studio (Nashville) the album CRAZY LIKE ME tells the musician's journey through the songs that bookmarked his most seminal moments. He kicks off the record with a rousing rendition of The Rock 'N Roll Trio's signature barn burner "Tear It Up"-which BILLY often famously covered on tour with Fleetwood Mac. He also takes on two of his biggest placements "Do I Every Cross Your Mind?" made famous by Ray Charles and Bonnie Raitt on 2004's Genius Loves Company-also recorded by Cher and Tom Jones-and "River Of Love," which marked George Strait's 57th #1 single. In addition, he unveils a new version of "Nothing To Do (And All Night To Do It)" and serves up other brand new songs, including such standouts as: "Ghost Town," "All Nighter" (co-written with Clare Dunn) and "I Remember You." A love letter to rock 'n' roll with the right amount of blues swagger and Americana perspective, CRAZY LIKE ME represents an inspiring life in music. "It's an album of songs I just wanted to do," he goes on. "The songs coincide with the book. It's a mish-mosh of hits and things people have never heard. I just went in and cut it. Rock 'n' roll is part of my DNA. I don't do it, because I have to do it; I do it because I love this kind of music. I've never done anything but this. I'm very blessed to have done this all my life. It's an overall look at my work as a writer, and it tells my story." And it's a rock 'n' roll story for the ages. Get Crazy with BILLY BURNETTE now.